A “glaring contradiction” in Government policy is hindering its efforts to improve the NHS, according to a new report by the independent think tank Reform. Its wish to achieve a higher quality and more efficient NHS is undermined by its support for national pay agreements for all NHS staff. Instead Ministers should give full support to those NHS organisations, such as the South West Consortium, which want to drop the national arrangements. The report, Doctors and nurses, argues that better employers deliver better health outcomes. It highlights world-leading organisations in the UK, the USA and India which have transformed their quality by improving their management of their workforce. The organisation with the highest staff satisfaction in the NHS, Salford Royal NHS Foundation Trust, has introduced innovative links between pay and performance. Other organisations measure the performance of staff and act on mediocrity or failure which undermines the quality, safety and compassion of care. The report shows that higher quality care is also cost-effective, for example by eliminating additional costs due to medical error. Given this evidence, Ministers should support those employers who want to improve their workforce and make it more cost effective. They should reject the current arguments of the NHS Employers umbrella organisation, which wishes to maintain the national arrangements and impose a further national pay freeze. Pay freezes prevent employers from using their discretion to change working practices or incentivise good performance. The Government has signalled interest in regional pay, which would see lower rates of pay in lower cost areas. This would save money but would not give employers the necessary encouragement to improve the quality of staff. A better model is the Government’s support for local pay arrangements for academy schools, at the school level. · Ministers should take the same position on the NHS workforce as Ministers responsible for other public services. Health Ministers, and indeed the Prime Minister, still defend the Government’s NHS policies by pointing to an increase in the number of doctors since 2010. Instead they should follow the approach set out by the Home Secretary who has argued in relation to the police: “what matters is not the total number of officers employed, but the total number of officers deployed and how effectively they are deployed”. · As in other public services, the financial pressure on the NHS should act a catalyst for innovation. For this to happen, Ministers will have to hold NHS leaders properly accountable for performance, including financial performance. The placing of the South London Healthcare NHS Trust into administration sends exactly the right signal to the rest of the Service. · The UK is heading towards a surplus of doctors. The surplus creates an opportunity to drive down pay and review medical ranks. A number of organisations are exploring variations on the traditional medical career, ending the notion that when doctors become consultants their “Certificate of Completion of Training” is a grant of freedom and job for life. Ministers should welcome these developments. · The primary care workforce needs urgent reform. Clinical Commissioning Groups should commission local primary care services through locally determined contracts. CCGs need the ability to manage the performance of GPs and bring in new providers, including the private sector. 1. Reform is an independent, non-party, charitable think tank whose mission is to set out a better way to deliver public services and economic prosperity. We believe that by liberalising the public sector, breaking monopoly and extending choice, high quality services can be made available for everyone. As the ‘notes for editors’ show, Reform positions itself as an independent, non-partisan, charitable organisation. Its website goes further, claiming ‘[w]e are determinedly independent and strictly non-party in our approach.” But just how independent and non-partisan is it? That’s easily seen by a quick examination of the origins and funding of the organisation and a look at the 3 personnel who were involved in creating the report. Reform was founded in 2001 by Nick Herbert (the same Nick Herbert who now, as a Tory MP, has been vigorously defending former Chief Whip Andrew Mitchell) along with Andrew Haldenby, one of the authors of the report. Mr Haldenby was formerly Head of the Political Section of the ‘Conservative Research Section‘, and then Director of Studies at the ‘Centre for Policy Stufdies‘, another ‘think tank’ – this one well-known as a neo-liberal (extreme free-market, small-state) one. 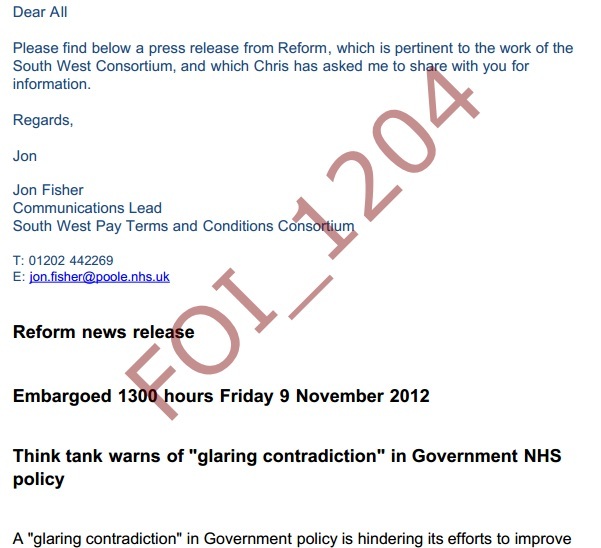 Mr Haldenby is still the Director of Reform. Reform‘s Chair is Sir Richard Sykes – a former pharmaceutical company Chairman. A former deputy director is Liz Truss, now a Tory MP and co-author of the disgraceful ‘Britannia Unchained‘, which ignores all the statistics to defame British workers as lazy and unproductive and in basically argues that we have to join the ‘race to the bottom’ in order to compete with India, China and other countries where ordinary workers are paid a pittance. Are you starting to get the feeling that ‘independent and non-party’ really means ‘Tory and profit-oriented’? If so, then you’ll probably agree that Reform‘s claims to be a ‘charity’ are similarly misleading once you’ve read a little further. The organisation is not set up to make a profit for itself, but it’s not very ‘charitable’ either – at least, not in any sense of wishing to help the disadvantaged. as well as large companies from a host of other sectors. All of these companies pay a minimum of £7,500 (and probably much more) to be ‘corporate partners’ – and, as with their donations to the Conservative party, large companies expect to make a profit on anything they invest. Small wonder, then, that Reform‘s ‘studies’ and ‘research’ turn out to ‘identify’ the ‘need’ for lower wages (it’s incredible how many simple words you have to put in speech-marks when you’re referring to how a Tory uses them!). Nor is it surprising that this particular report regards a surplus of doctors as an ‘opportunity to drive down pay‘ and even recommends maximising the intake of immigrant doctors when a surplus already exists, as a way of making yet another well-paid vocation into a poorly-paid commodity. Mr Seddon’s previous employment was with Circle, a well-known private healthcare company, which controversially took over Hinchinbrooke Hospital in Cambridgeshire and is on record as being hungry to take over others. He has written other reports on healthcare, including one which he somehow fooled the Health Service Journal (HSJ) into publishing, titled ‘Hunt should remove workforce straitjackets‘. Sounds an admirable sentiment – except that when you read the article, you see that he’s not arguing for the liberation of the NHS workforce, but rather calling the workforce, and the pay agreements that govern their salaries, the ‘straitjacket’ and calling for the Health Secretary to remove the restraints so that NHS Trusts are free to pay their workers whatever they feel like. Seddon clearly shares the endemic right-wing obsession with US healthcare, and shares the accompanying blindness to the fact that, while the US undoubtedly has some outstanding hospitals, these hospitals charge huge fees while access to healthcare for ordinary people is precarious or almost non-existent. He also ignores the obvious fact that putting doctors on a one-year, performance-related contract in which they are ‘benchmarked’ for their clinical outcomes has one sure side-effect: doctors who are afraid to take on difficult cases and perform tricky operations in case this affects their ‘benchmarking’ stats, and hospitals that are afraid to take patients with complex conditions in case their ‘published clinical outcomes’ suffer. But being simplistic is apparently no bar to success in the circles in which Mr Seddon operates. Mr Cawston is the junior author of the report, but absolutely a chip off the old block, and sharing his seniors’ obsession – of the 4 articles he has had published in the HSJ, 3 insist that we in the UK need to learn from the US system in order to improve the NHS. He also writes for the Spectator, the Mail Online and the Telegraph Online – all Tory rags with clear right-wing agendas on healthcare as well as other things. I think it’s beyond question that Reform is anything but independent and non-party. I could round off with a summary of what this deceptive approach says about Tory morality and trustworthiness, and their readiness to use any ruse to fool people. But I think I have a better way to end this article and portray what needs to be portrayed. It’s possible to construct a fallacious argument in favour of a more US-style system here in the UK, to fool the unwary and the credulous – if you cherry-pick a few institutions and ignore the big picture. But even a recognised expert in economics from a right-wing viewpoint can’t help but acknowledge that the NHS – which is the 2nd most-efficient in the world and costs less than half per person what the US spends on healthcare even without a socialised health system – is far better in terms of outcomes to cost. But then, Prof Morici isn’t working for a ‘charity’ that is paid undisclosed sums of money by private healthcare providers that are on record as orchestrating press campaigns to support NHS privatisation. Great work again from the pen of @skwalker1964 Wonder if Charity Commission could/would revoke the charitable status of REFORM. Evidently it is not a neutral organisation with 2 important members now Tory MPs! In other words, it doesn’t matter if some of the most highly skilled professionals aren’t re-employed because they can find alternative employment or just emigrate – who cares? They could no doubt be better employed in the private sector to benefit those who can pay more. To cut costs, let the most highly skilled and paid go elsewhere. Let the NHS instead make do with the cheapest and least skilled – why not? Then the most complex cases presented in the NHS (and which sector often passes these to the NHS?) will no longer be treatable there and such cases presented in the private sector, despite now employing the most highly skilled professionals, will still be viewed as the most risky and those most likely to increase their legal and so insurance liability costs and decrease their shareholder dividends. The most highly skilled will be underemployed while patients with serious but treatable conditions won’t be. Hi.Also http://bit.ly/Wl6JPC for hangover rant.. I have to say that I am aware that Reform’s agenda is only operating in the interests of the privateers. What it doesn’t say here is what the solution is. Occupation of those facilities that are under threat – i.e. all of them, is the only way IMO that any rush to break up the NHS and hand it over to the greedy private companies can be stopped and reversed. Not sure about the only way, but certainly one way I’d approve of!